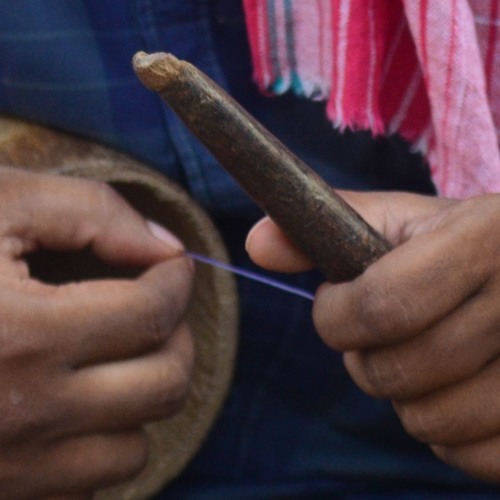 Ghuduki is an indigenous musical instrument of Odisha. It is extremely simple in its construction, consisting of a single wire pulled taut through a hollow cylinder using a wooden bar. Music is produced by strumming the string at different places with different levels of force. The 'sound' produced is the vibration of the string, which is stylised by using several complex patterns. Though one of the simplest instruments, the Ghuduki's sound can be extremely addictive when paired with the right songs, and so true is this that there is an entire folk dance-drama form named after the Ghuduki. This performance was recorded in March 2018, with the artiste being Shri Rankanidhi Behera (a veteran duari of Bharata Lila)at the Jagannatha Temple of Marada.